What should the card "backs" look like? Re: What should the card "backs" look like? This makes sense. However, wouldn't it be easiest for the user to print the .pdf double-sided? In that case, wouldn't the front and back automatically line up? That seems to be optimal. Unfortunately, this is really tough to do. Primarily because when things are printed from home, we're at the mercy of the specific printer settings a person might have with their particular model of printer/computer, etc. As well, since we're printing from a webpage (even with CSS info), we're also at the mercy of the browser print settings. In all, what we've done so far, is simply made it so that regardless of borders, etc, we can print 6 in high res, with a high chance of the card dimensions being identical regardless of "who" prints it. This is why we're hoping for a "busy-ish" pattern for the back. That way, alignment is less important. Just so I'm clear, how are people expected to print out cards now? By cutting out all the cards and gluing the front and back together or something...? Ooooor you could print out one half, take the piece of paper, put it back into the printer and print out the card backs on the other side. Location : A little slice of your consciousness. Wootfish wrote: Ooooor you could print out one half, take the piece of paper, put it back into the printer and print out the card backs on the other side. That's what I had in mind. It's been my experience that most printers these days can handle double-sided printing without much issue. In my view, a logo is too important not to include: double-sided printing would have to be a problem for a significant subset of people to warrant it. I agree -- a logo is really key. If two people are playing Phylomon and everyone nearby can see the cards' logo, they'll get curious. And they'll have a name to look up if they're impressed by the game. And you don't even need double sided printing. You can, after all, just print one side, take the printout, turn it over and run it through again. Actually, since most desktop printers take a sheet of paper, pull it in, turn it around, and then print on the side that was facing down in the tray, you don't even need to turn the printout over. You can just take it and put it face-up in the tray. There's a problem with double-sided printing: Making sure that the image on side 1 of the paper is properly aligned with the image on side 2 of the paper. I would like to suggest that Phylo handle this problem by making a "card back" image which is actually as big as the entire paper. That way, paper-side-alignment simply isn't a problem. Hmmm... different paper sizes. It might be appropriate to have separate 'card back' images for letter-size (8.5"x11"), legal size (8.5"x14"), and A4 (210 mm × 297 mm) pages? Possibly. Or we could just go with the lowest commonly used size and center it on the page. Honestly I'm not sure which would be better -- I'd go with centering, just because it means that everyone's cards would be pretty much the same size, and that seems good. But I could see making a case for either side. Wootfish wrote: Possibly. Or we could just go with the lowest commonly used size and center it on the page. Honestly I'm not sure which would be better -- I'd go with centering, just because it means that everyone's cards would be pretty much the same size, and that seems good. But I could see making a case for either side. said back image would have to be uniformly patterned. as it stands, different cards have different backs with the graphic you have in the illustration. Sounds like everyone is getting the "busy" aspect of the back request. This is why, so far, I'm thinking Naturalismus bacterial one is the sort of things we're aiming for (i.e. it has a logo, looks nice, and it's busy enough to work with the "cut anywhere and it looks o.k." aspect). (p.s. I did receive permission from the artist, so we're clear if we want to use it). I'm wondering if a reasonable step is to find similar creative commons images that are busy with plants, animals, reptiles, etc and then try to mash it together so that a "biodiversity" rich back is created? davehwng wrote: Sounds like everyone is getting the "busy" aspect of the back request. This is why, so far, I'm thinking Naturalismus bacterial one is the sort of things we're aiming for (i.e. it has a logo, looks nice, and it's busy enough to work with the "cut anywhere and it looks o.k." aspect). One of the strengths of Naturalismus's back is its homogeneity. If we were to throw in different species, would it not be easier to identify individual cards by their backs? Perhaps I'm making a mountain out of a molehill here, but it looks rather like a mountain anyway from where I stand. This is the same issue I'm seeing. That using an image like that; the player may come to memorize the different image patterns and know what card they'll draw next. I personally would like a pattern with some bigger animals and plants, but I couldn't find any creative commons pattern and I have no time to make one. 1). Charles Darwin's finches. There are very old (public domain) black and white illustrations of the finch's heads which could be arranged in patterns, sush as every other one right side up/up side down on a grid to print correctly in either direction; circles of finches; etc. 2). Something to represent Carl Linnaeus, the father of modern taxonomy. His last name means "Linden", so maybe a detailed image of a linden tree with a mirror image of itself so that it would print the same either way (sort of like the face cards in a deck). Or maybe a pattern of his personal emblem, the Linnaea borealis, aka the twinflower, which is a purple bell-shaped flower. etc. There are at least a few dozen. If one of the goals is to include orgs creating their own decks of cards perhaps instead of designing a back for all cards, designing a template would suffice? The blank template design (featuring a prominent Phylo logo) could be used for the original base decks issued by this site, and NGOs could add their own backdrop and flourish representative of their deck and goals. It's just the game name with some animals in them. It's ink friendly, so folks will be more likely to actually print them. Also, the layout is simple and centred, so there will be less compatibility issues with printers, errors would only knock the logo off-centre slightly, and there is no need to worry about cutting patterns in weird places. If NGOs did want to make their own decks they could spring for better printing. The issue of course would be that you can tell where a card is from. Maybe customized redesigns could be limited to the front. There are 2, interrelated issues in play here regarding the notion of a generic back that, for example, a home user would print out, in contrast to what another organisation would actually want printed. In the first instance in keeping with the CC/Open Sourcy foundation, people like choice so I think what we are doing here is simply providing them with a number of options. The key thing will be how to enable someone to choose from a gallery of backings, or upload their own backing, and have a PDF produced that they can use to print the other side of their card sheets with or print a separate sheet to glue onto the back of their card sheet. Giving kids choices of different backings if they are producing their cards at home is a nice way for them to differentiate their decks from their friends decks. In the second instance we are talking about an organisation professionally printing a (hopefully) quality deck. To do this they need very clear guidelines on card dimensions, stock, colours, possibly inks, and the background. Now, keeping this thread focussed on the background because the other points need to be in a different thread, that orgaganisation will want control of the branding of the backs of their cards. This development group we are all a part of need to be able to provide some guidance on the back without stipulating controls about the back. a. A Phylo logo (note I didn't say THE Phylo logo as there already appear to be variations of this). Reqmt: Highly recommended. b. The organisation's logo. Reqmt: Highly recommended. c. The Phylogame URL. Reqmt: Nice to have. d. The organisation's URL: Reqmt: Nice to have. e. Either of the c. or d. URL's expressed as QR codes. Reqmt: Suggestion only. One of things I considered but dismissed is a QR code or URL that links to a Wiki entry about the species on the other side of the card. 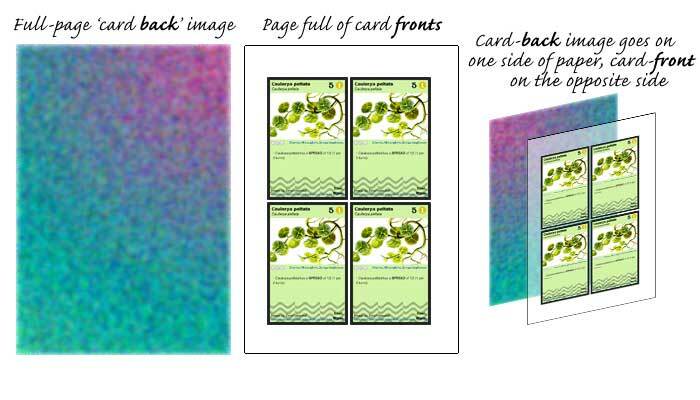 Co-ordinating the content of backprinting with frontprinting puts the price up so it's far easier to have identical content on the back of every card. We want organisations to produce hundreds of copies of these decks and sell them in their Zoo/Museum/wherever shops at cost price - we need to give them positive reasons to doing that and Brand exposure is a good incentive. Similarly schools may print their own decks and will want school branding on them. By the way, I love all the graphics suggestions above. They are brilliant. i like the idea of providing many backs to give home users a choice, its a great way to let kids make the game their own. as for branding, i think its important to ensure that the game's branding is the most prominent, since we are promoting the cards as collectable, and the game as compatible between decks. i don't think the brand exposure angle is one we should take with partner organizations. providing kids a reason visit their locations, and offering a vehicle to promote their cause (with their custom animals and events) shoul be draw enough. the issue with different backs is that your opponent can know your cards. For example, if I own a starter deck and have collected a card with strong abilities from an event at a museum that has a different back, you will know when i have it in my hand and can anticipate and defend against its effects. i think perhaps we should take a cue from the pros and have one ubiquitious design, and let the branding happen on the front with special art etc. i'm not sure i like the idea of including URLs, everything about the card will be searchable and it could mean cluttered and uneven designs that are hard to get right on regular printers (which is my opinion of the links on the front as well, the name credit should be enough). Though that leads me to another thought - what will happen to the info currently on the "back"? Perhaps some sort of index (pokedex?) should be made where kids can easily access more info about their creatures? Just an update. I'm on sabbatical at the Natural History Museum. They have a free kid's magazine which will have a poster of about 30 or so cards (that also crosslink with some of their specimens). The museum (presumably its graphic department) sounds interested to have a go at creating a "card back." davehwng wrote: 3. Could the back also help with representing some of the spread features (i.e. specifically include images of things like plants)? Yes, I think if the backs are going to be used for the SPREAD rule, the back should look like organisms that spread, and that an image or the whole back should indicate a direction so that it is easier to follow the spread of a species by following the "arrows" and to trace back to the originating card. It looks fancy, is this the official card back? The official card back is actually something that can be found at the starter deck pdf (last page). We should put that up as a stand alone in the blog section soon. What about hearkening to its namesake and having some kind of evolutionary "tree of life"? It's dendritic, and you can have all the kingdoms/phyla right there on the back of the card. I'm too new to post links, but take a look at the "Tree of Life webproject" "what is phylogeny" page for an example. I think it's substantial material for artists to play with. Kudos to whomever came up with this game and project by the way! » Master Card "gift" cards -- STAY AWAY!!! !